Whether it’s yelling “Blackjack!” or hearing “New shooter!” announced, Casino Del Mar has the excitement you’re looking for. We have games and tables to accommodate anyone from first timers to seasoned high rollers. Come down and feel the rush tonight! Casino del Mar offers you a variety of 12 Black Jack Tables, of which 4 bring you the traditional game and 8 tables with side bets (7 lucky lucky and 1 21+3), a more modern approach to an old classic. Place your bet! The object of the game is to get closest to 21 without going over, by adding the value of the cards dealt in each hand. In Black Jack, you play against the Dealer’s hand. After the bets are placed, the Dealer draws two cards for each player and one for himself. After you see the dealer’s card against yours, you have the option of “Staying” with the cards you have, the signal is made by waving your hand palm-side down on top of your cards. The other option is to “Hit”, which means that you are asking the Dealer to draw another card for you. This is signaled by tapping your hand once on either side of your cards. Every player on the table has made their choice, and now the dealer draws his second card. If his cards add up to 16 or less, he must draw another card. But if his cards add up to 17 or more, the dealer must “Stay”. If your hand is better than the dealer’s, you’ve won! The dealer will then pay you even to what you have bet. If the Dealer’s cards and your end up adding to the same amount, you neither win nor lose money; this is called a “Push”. The best hand of the game is a Black Jack, consisting of an Ace and a 10-value card on the player’s first two cards. A Black Jack hand automatically wins, and it typically pays 3 to 2, or one and a half times your bet. There is a way to protect your bet, if the dealer’s first card is an Ace, and this is called “Insurance”, which you can get by placing up to one half of your original bet besides the initial wager. Players who buyinsurance on a hand in which the dealer has a Black Jack, loses his original wager, but gets paid the insurance 2 to 1. Other options to wager more money in Black Jack is to “Split” or “Double Down”. To “Split”, you must have two cards of the same value in your initial draw and by placing a bet equal to your original wager; you now can play two hands. To “Double Down”, you must place a wager equal to the original bet whenever you feel you have an advantage over the dealer. Another way you can win at Black Jack is by playing the side bet “Lucky Lucky”, where you can bet a minimum of $1 and combine your first two cards with the Dealer’s first card to make a winning combination. Casino Del Mar takes you to another level of play, where you can be submerged in the sophisticated ambiance while flirting with Lady Luck. In most casinos you can bet on either of the games but some casinos require you to make an Ante Bet in order to bet the Pair Plus portion of the game. There are three betting circles in front of each seat. The top betting circle is labeled Pair Plus where the player puts a wager on the pair plus game. Beneath that are two circles labeled Ante and Play for the base game. The game starts with the player making a wager in the Pair Plus and or Ante circle equal to the table minimum. After all the players have made their bets the dealer will give each player a three card hand that is dealt by the Shuffle Master machine. Play begins with the first player to the dealer’s left and continues clockwise around the table. Straight Flush. Three cards of the same suit in sequence. Example 6-7-8 of spades. Three of a Kind. Three cards of equal rank. Straight. Three cards in sequence of mixed suits. Flush. Three cards of the same suit. Pair. Two cards of equal rank. High Card. The highest card in your hand. There is a bonus payout on the Ante bet for certain hands and the bonus does not require an additional wager. If you have a straight, three-of-a-kind or straight flush, you will be paid a bonus whether you beat the dealer or not. The bonus payout is paid based on the pay table posted at the table. The payout schedule for the Ante Bonus varies from casino to casino but not by much. For a straight flush you will be paid 5 to 1 or 4 to 1. For three of a kind you will be paid 4 to 1 or 3 to 1. For a straight you receive 1 to 1 for your Ante bet. The pay out structure for the Ante Bonus affects the overall house edge on the Ante/Play portion of the game. A payout of 5 -4 -1 has a house edge of about 3.4 percent. While the payout of 4 – 3- 1 has a house edge of 6.8 percent. To determine if your hand is better than Q-6-4 start with your first highest card and compare it to the Queen, if it is higher you play. You ignore the other two cards. If your first card is a Queen and your second card is higher than 6 you would still play regardless of the ranking of your third card. If it is lower than 6 you don’t play. Much of the popularity of Three Card Poker comes from the simplicity of the game. Since you are not playing against the other players a camaraderie can develop amongst the players as they root and cheer for each other to beat the dealer. Looking for a game without complications? Roulette is just it! 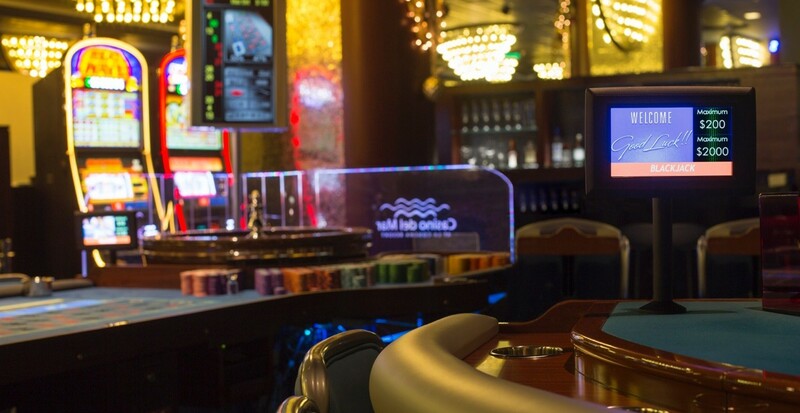 Casino Del Mar operates three modern Roulette Tables, with light-up layouts and monitors that show the winning numbers, tendencies, among other helpful information for the player. Here’s how to play. The object of the game is to bet on the number on which the ball will come to rest after spinning round the roulette wheel. The wheel is composed of 38 sections numbered from 0 to 36, the thirty-eighth section being 00 (double zero). The game begins when the player places the bets of his choice. The croupier spins the ball in the wheel and when it is about to make its last two rounds, he announces “No more bets” and you must stop placing bets. The ball is on the point of coming to rest: this is the moment when everyone holds theirbreath, their eyes riveted on the roulette wheel. The croupier announces the winning number. Losing bets are raked in and winning bets are paid out. Easy, right? If you have any lucky numbers, go ahead and bet on them, for a chance to win up to 35 times what you wagered! here is no place like Casino Del Mar to watch your numbers light up on the table and have a true winning experience. Casino Del Mar has an exclusive Asian-themed area, where players can enjoy the game of EZ Baccarat. This version of Baccarat replaces the taking of the commission on every winning Bank hand by “barring”one specific winning Bank hand – a three card total of seven. The appearance of this hand is the “Dragon”. Customers can make an insurance bet – the Dragon7 bet – that pays 40 to 1 when the three card winning Bank hand occurs. The object of the game is the same as regular baccarat, which is to have the highest total point hand,the highest hand being a natural (two-card) 9. All face value cards and ten value cards have a point value of zero, and Aces have a point value of 1. The card point values are summed, and the tens column of the total count is ignored. The customer makes a wager on the “Player” hand, the “Banker” hand, a tie hand or combinations of the above. The customer can optionally place an insurance side bet on the”Dragon” – a three card winning Banker hand totaling 7 – called the Dragon7 bet. Two cards are dealt to the Player and Banker alternatively, starting with the Player. The Player hand is resolved first. If either the Player or the Banker hand achieve a total of 8 or 9 on the initial deal (known as a ‘natural’), no further cards are drawn. If neither Player nor Banker hand has an 8 or a 9 the game continues. If the player has a point value of 5 or less, an additional card is dealt to the Player hand. If the Player hand has an initial total of 6 or 7, he stands. After the cards have been drawn according to the game rules, the hand with the highest total wins, except if the winning Bank hand is a “Dragon”. If the Banker hand is a Dragon, which is that the banker wins with a three-card total of 7, the Banker hand is a push, the Player and Tie hands lose and the Dragon7 bet wins. No commissions are paid on winning Bank hands. The Dragon7 bet loses at all other results. If both the Player and Banker hand has the same point total, the hand is a push and the tie bet wins. Bets on the Player and Banker hands pay even money, except the “Dragon” that pushes. Ifthe Player and Banker hands tie, the wagers on these hands are a push. The tie bet pays 8:1. The Dragon7 side bet pays 40:1. Want to go for the Progressive? Place an additional bet for a chance to win Thousands with the table’s new progressive jackpot! Take your time to get familiarized with the game in our lounge area, while you sip on your favorite drinks, always complimentary to players. Enjoy the exotic side of Casino Del Mar and Live to play! Craps is one of the most social and exciting games in a Casino, and here in Casino Del Mar, we make the experience even more exhilarant. Although it can seem complicated, the truth is Craps can be enjoyed at any level of expertise. Let us show you some basic rules of the game. 7 or 11- You win! The shooter then rolls another Come Out roll. 2, 3, or 12-You lose. The shooter then rolls another Come Out roll. 4, 5, 6, 8, 9, 10-Enter the Point round. So you’re either going to win, lose, or go to the Point round. If you win, the dealer will pay you the amount of your bet. For example: if you’d bet a $5 chip, they’ll give you another $5 chip. If you lose, then they’ll take your chip away. If you didn’t win or lose right away, then you go to the Point round, and the dealer turns the hockey puck to ON and places it on the number that was rolled (4,5,6,8,9,or 10). That number is called the Point. Now you’ll win if the shooter rolls the Point again, and you’ll lose if he rolls a 7 first. Rolling a 7 before rolling the point again is called “sevening out”. While you are trying to roll the point you can bet on the place bets (4, 5, 6, 8, 9, and 10), hard ways, fill and proposition bets. You could go play craps now with what you’ve already learned. And in fact, by just making the Pass Line bet you are ready to go! But if you really want to get deeper inside the action, our friendly dealers and supervisors will be happy to help you.